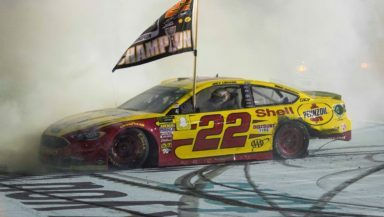 DAYTONA BEACH, Fla. (Nov. 19, 2018) – Following a long and winding road, Joey Logano finally owns the biggest prize in motorsports. The driver of the No. 22 Team Penske Ford capped off a memorable season in fitting fashion – by capturing the 2018 Monster Energy NASCAR Cup Series championship with a victory in Sunday’s Ford EcoBoost 400 at Homestead-Miami Speedway. To take the title, Logano outdueled his Championship 4 competitors Martin Truex Jr. (second), Kevin Harvick (third) and Kyle Busch (fourth). This was the Middletown, Connecticut, native’s third trip to the Championship 4 (2014, 2016). Logano had a strong season, securing his spot in the Playoffs with a win at Talladega Superspeedway. Once the Playoffs began, Logano upped his performance to another level, recording a top-10 finish in eight of the 10 postseason races and scoring more points than any other driver. He won the opening race of the Round of 8 at Martinsville in a wild finish securing his spot in the Championship 4. Logano finished the season with three wins, 12 top fives and 25 top 10s. Logano’s title also marks the second championship for Team Penske and owner Roger Penske. The organization’s first title was in 2012 when Brad Keselowski and the No. 2 team won the title. William Byron clinched the Sunoco Rookie of the Year title following the race at ISM Raceway. Byron won rookie of the year in 2016 in the NASCAR Camping World Truck Series and went on to win it again in 2017 in the NASCAR Xfinity Series. On the strength of a series-high 19 victories, Ford won the Monster Energy Series Manufacturer Championship.